To give variety and to supply the body with muscle building and repairing substances, poultry are served for lunch and dinner. Some people prefer chicken to duck or turkey. I read in one book that for some people with sickness complications it’s better to have more white meat than red meat. For this chicken is good provided you pick the white meat in chicken breast. 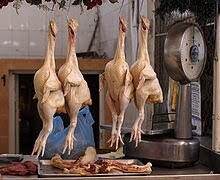 Chicken is sold by the kilo and by the size. It is available and sold the whole year round. Some families raise chicken and they have the native and commercial ones. Some buy live chicken which are cheaper than the dressed ones. A spring chicken is less than four months old which is best for frying. A broiler is a young chicken that weighs one to one half pound. 1. The breastbone of a young chicken is soft and flexible. 2. A young chicken has smooth yellow legs. 3. An older chicken has scaly legs. 4. A young chicken when dressed has plenty of pin feathers. 5. The breastbone of an older chicken is firm. 6. An older chicken when dressed has long hairs instead of pin feathers. Now that you know how to choose the fresh and good chicken meat you'll be able to cook some yummy recipes like afritada, adobo, hawaiian chicken, chicken barbecue, fried chicken, tinola, chicken hamonado, pickled chicken and many others.